Any good college town has a slew of breakfast options, and Boulder, Colorado, is no different. 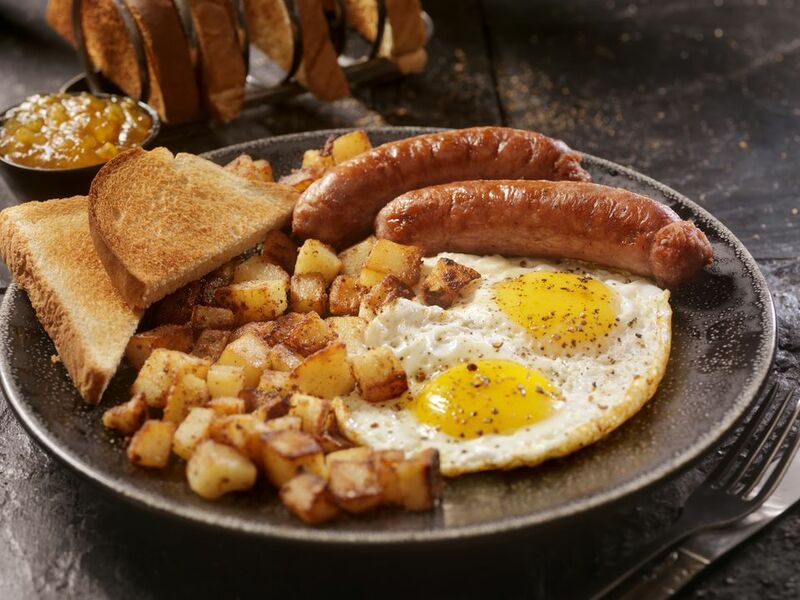 From flapjacks piled high to sizzling egg skillets and breakfast burritos, diners can find a variety of styles and options at local restaurants. Before you head out for a short hike in Boulder, consider grabbing a hearty breakfast at one of these great local restaurants—many of which are open extra early so you can get to the trails to catch the sunrise. Whether you've recently moved to the city or are just visiting this small yet thriving mountain town northwest of Denver, there are plenty of places to get a great breakfast in Boulder. Check out some of these great options below. Rated the "Best Diner in Colorado" by Business Insider, the Village Coffee Shop in Boulder is open from 5:30 a.m. Monday through Saturday and 7 a.m. on Sunday. The Village is a Boulder staple that serves straightforward yet delicious breakfast options. It has the small and unmistakable feel of a diner with table and counter-seating, and the menu is packed with classics like egg combos, omelets, pancakes and French toast. The place is usually loud and busy, and the wait staff is friendly but no-nonsense. If you come at peak time on a Saturday or Sunday, chances are there will be a wait, but it won’t be long as the turnover is pretty quick. However, one of the best features of the Village is the price as everything on the menu is affordable, so it's certainly worth the wait. The original Walnut Cafe and its south Boulder counterpart serve tasty breakfast with a Boulder twist daily from 7 a.m to 3 p.m.
Gluten-free and vegan options are plentiful, and health nuts can find enough wheat bread and grilled veggies to keep them happy as well. The menu also features great deals for big eaters and meat lovers including breakfast burritos and Belgian waffles piled with toppings. Walnut Cafe also contributes part of their business earnings to the Kirk Rocky Derichsweiler Foundation, which educates people about organ donation and living healthy lifestyles through biking, hiking, and enjoying the outdoors with a special focus on youth engagement activities. The Buff Restaurant is a family-owned restaurant that originally opened in 1995 but relocated to its central Boulder location in 2014. The Buff has become an area favorite, serving fresh, local foods at reasonable prices. The menu sports an impressive array of eggs Benedict and Southwestern options like huevos rancheros and chimichangas as well as 99-cent mimosa, bloody mary, and tequila sunrise cocktails. Local products include Boulder Granola, Avery Beer, Ozo Coffee, Polidori Sausage, 303 Vodka, and Teatulia Organic Teas. The Buff Restaurant's owners Jacquie and Chris Meyer built their business on sustainable practices, earning recognition from Western Disposal after moving to a new location in 2014 for diverting more than 95 percent of potential waste into compost and recyclables. Snooze is a family-owned "a.m. eatery" chain based out of Denver serving breakfast classics with a modern twist daily from 7 a.m. to 3 p.m. Located just a few blocks from the Boulder Theatre at 16th and Pearl Streets, Snooze features a modern design (2006) and colorful atmosphere, but the wait times can stretch up to an hour during the busiest peak hours. The menu features unique pancake options such as pineapple upside down, sweet potato, and coffee and donuts garnished with pecans and flavored butter. Snooze also boasts an expansive espresso bar and breakfast cocktail menu. The Snooze family also values responsible and sustainable business practices and has been recognized by Climate Wise, the Colorado Environmental Leadership Program Gold Level, and Certifiably Green Denver. Each month, locations for Snooze in Colorado, Arizona, and Texas also offer educational resources for different ways to "go green." Snooze's "12 Months of Green" program features themes including recycling, chemicals, education, food, transportation, water, energy, compost, community, materials, landfills, and lighting. Located in North Boulder far away from the college crowd of University Hill in the south, Lucky's Cafe at Lucky's Market is the neighborhood's go-to breakfast spot. The cafe draws a more adult crowd and almost always has an open table. The menu boasts reasonably priced classics like eggs, bacon, and hash browns as well as a variety of pancakes and omelets. There's also a great selection of organic coffees and teas as well as health-friendly, vegan, and gluten-free options. Established in 2003, Lucky's Cafe uses fresh, organic ingredients from the attached Lucky's Market in most of its dishes, making for a truly delicious meal no matter what you order. Created by two chefs in Denver, this regional chain of markets and cafes depends on a mantra of providing the best ingredients for chefs and casual cookers in the area. Once featured on Guy Fieri's popular show "Diners, Drive-Ins, and Dives," Foolish Craig's Cafe in Boulder has been serving organic meals to the area since it opened in 1998. Foolish Craig’s might be the most “Boulder” establishment on this list; nearly everything is made from scratch, with a bevy of ingredients from local suppliers used to make fresh and organic breakfast dishes. It’s known for its crepes, many stuffed with the likes of mushrooms, sundried tomatoes, and eggplant, but there’s also a good selection of omelets and sandwiches—all at reasonable prices. The oldest restaurant on the list, Lucile's is housed in a yellow Victorian house at 14th and Pine Streets and has been in business since 1980. While it’s expanded over the years to include five locations, the original Boulder spot is the heart and soul of the restaurant. Open seven days a week, Lucille's in Boulder serves up a taste of New Orleans with Creole-inspired breakfast dishes. The food itself is top notch starting with the big fluffy biscuit and moving on to Southern favorites like the Creole omelet and shrimp and grits. Be warned: the portions are huge, and chances are you’ll be needing a to-go box.